Scooper - Technology News: How much could Brexit wipe off UK GDP? How much could Brexit wipe off UK GDP? A plethora of analyses attempt to quantify the economic effects of Brexit (or of EU membership) for the UK. The results are rather confusing – ranging from significant advantages to marked losses. The most pessimistic study concludes that the UK is worse off by about 11.5% of GDP because of EU membership (Congdon 2014, p. 25). The other extreme is covered by studies that estimate the possible benefits of the UK’s membership of the EU to be in the range of 20% (GDP per capita) or more (Henrekson et al. 1997, Badinger 2005, Campos et al. 2015). A range in the order of more than 30 percentage points certainly appears to be quite astounding and calls for a deeper comparative analysis. We attempt this venture with a thorough meta-analysis (Busch and Matthes 2016). Our study portrays the various economic effects of Brexit qualitatively and provides a systematic overview of the main studies (published as of early April 2016). We distinguish between theory-based, forward-looking (ex ante) studies (many of which, but not all, are based on own models) and backward-looking (ex post) studies. Our comparison shows that the diverging results can be explained by significantly different methods and assumptions, as well as varying coverage of effects. Only moderate and manageable effects? Obviously, only studies that include positive and negative effects of Brexit provide a sound basis for summarising conclusions. On the positive side, fiscal savings due to the (partial) elimination of EU contributions and lower economic distortions are relevant because the UK can lower external EU trade barriers and can withdraw from the Common Agricultural Policy in case of Brexit. On the negative side, the losses due to reduced trade integration are augmented by future losses from foregone new EU trade agreements and from foregone reductions of non-tariff barriers in the Internal Market. Our overview portrays the various effects covered (or not covered) by each study. It shows that no forward-looking study covers all relevant aspects at the same time in sufficient detail. Based on the ex ante model-based studies considered relatively reliable and comprehensive, a certain consensus seems to have emerged. First, the disadvantages from lower economic integration appear to outweigh the economic advantages. However, overall, several reviews come to similar (mainstream) conclusions that the net economic effects of Brexit should lie in the lower single digit range between 1% and mostly significantly below 5% of GDP in the longer term (e.g. CEBR 2015, p. 28, CBI 2013, p. 79). Thus, the economic effects of Brexit seem manageable and the decision to leave the EU appears to be mainly a political consideration about sovereignty and self-determination. However, we raise serious doubts about this mainstream conclusion. In fact, important shortcomings of the mainstream methods are likely to conceal significantly higher risks. Even the more reliable forward-looking, model-based studies are unable to cover all relevant channels by which economic integration raises welfare. Figures 1 to 3 provide an overview of the effects which are hardly covered: positive static and dynamic trade effects on welfare and growth, as well as additional non-trade effects of economic integration. 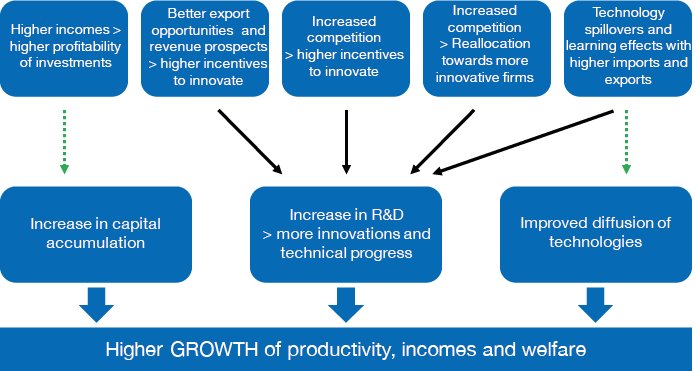 Particularly, positive effects from higher competition on innovation and on firm selection, which are induced by more trade and FDI, are hardly covered. We take stock of the substantial theoretic and empirical support for these additional welfare and growth effects thoroughly. In doing so, we point out, however, that the available empirical evidence concerns only the individual effects and is hardly focused on European integration or the case of Brexit. The general problem for economists lies in the fact that there is no universally accepted theory-based ex ante estimation method available to integrate all of these specific effects in a comprehensive way. Going beyond the available forward-looking methods towards ex post analyses implies entering somewhat less solid ground. We venture on this avenue and present several backward-looking studies that use existing data. These studies attempt to quantify comprehensive welfare effects of EU integration or Brexit, but are able to do so only in an implicit and less theoretically explicit way. All of these attempts can be criticised to some extent, because it is notoriously difficult to ascribe welfare effects to EU integration as many other factors influence welfare at the same time. However, the overall take on backward-looking studies suggests that Brexit could cause a significantly worse economic impact in a more pessimistic scenario than the mainstream conclusions indicate. Notes: Green arrow: effect covered in most ex ante CGE and NQTM trade models (not in non-trade CGE models for UK); dotted green arrow: effect covered in at least one, but only a few ex ante models; these models only cover selected effects; black arrow: effect not covered in ex ante models. Source: Authors’ own design. Notes: Dotted green arrow: effect covered in at least one, but only a few ex ante models; these models only cover selected effects; black arrow: effect not covered in ex ante models. Source: Authors’ own design. Sound evidence exists that theoretical forward-looking trade models tend to underestimate the trade effects of economic integration. In fact, ex post studies tend to find significantly larger trade effects of trade agreements than ex ante models, such as CGE models (Rosa and Gilbert 2005, Baier et al. 2008, Pelkmans et al. 2014). Recent methodological developments tend to increase this divergence. A new strand of the literature argues that traditional gravity models – the workhorse for ex post analysis of trade agreements – also tend to underestimate trade outcomes (Baier and Bergstrand 2007, Egger et al. 2011). Based on a more modern gravity approach, Baier et al. (2008) estimate that membership of the EU (and of its institutional predecessors) has raised trade between members by between 100% and 125% over a 15-year period alone. Based on these insights, we describe three strands of backward-looking studies that attempt to quantify additional welfare, income and growth effects in a more encompassing (but necessarily only implicit) way (Busch and Matthes 2016). -Using recent forecasts for the negative effects of Brexit on bilateral trade between the UK and the EU, the induced income decline can be quantified in a tentative way. Based on a generaltrade-income-relationshipcalculated by recent thorough studies, three studies estimate that UK incomes could possibly decline by around 10% or more in a more pessimistic scenario (Ottaviano et al. 2014, Aichele and Felbermayr 2015, Crafts 2015). An important shortcoming of these attempts lies in the fact that the trade-income relationship could not be tailored specifically to the UK. -Several studies employ regression analyses(Henrekson et al. 1997, Badinger 2005, Crespo Cuaresma et al. 2008). Even though the results differ in their details, these studies identify sizeable effects of EU membership on the level of GDP in the long term – mostly in the range of 20% or more. However, some uncertainties remain, as the results are in part not completely robust and as growth regressions are notoriously difficult to make watertight. -Campos et al. (2014, 2015) apply a relatively new synthetic counterfactual method (SCM) which was developed by Abadie and Gardeazabal (2003). Mimicking the approach of clinical studies, the authors construct an artificial synthetic control group by selecting countries with similar economic performance to the UK during a longer time beforeEU accession in 1973 (pre-treatment period). The effect of EU membership (treatment) can be deduced from the difference between the economic outcome for the UK and that for the control group. Campos et al. (2015) estimate that in the long run (between EU accession by the UK up to 2008), real GDP per capita in the UK is nearly 24% higher than in the synthetic control group. However, this result is not very robust. Focusing on the findings of various robustness checks on productivity increases over a ten-year horizon, the respective results lie in the higher single digit range (up to 10%). This is still a substantial result, particularly when taking into consideration that benefits might increase further over time. The forward-looking, mainstream model-based studies are unable to capture many additional effects of economic integration on welfare and growth. Therefore, the mainstream results which conclude that Brexit would cause only moderate economic damage should be taken with caution. Higher risks appear likely when the specific additional welfare and growth effects are analysed. The same is true when the fact that backward-looking studies find significantly larger trade effects of economic integration agreements than forward-looking models is taken into account. Therefore, backward-looking studies which derive welfare effects should not be neglected in building an opinion on the possible economic outcome of Brexit. While not completely robust, they provide important indications that the economic loss to the UK could be significantly larger than in the low single digit range. This would be particularly relevant in case the political striving for regaining regulatory sovereignty in the UK prevails and, as a result, the future degree of economic integration between the UK and the EU deteriorates significantly. In this more pessimistic scenario, our study warns of the risk that GDP losses to the UK in the broad range of 10% or more cannot be ruled out in the long run in case of Brexit. Abadie, A. and J. Gardeazabal (2003), “The Economic Costs of Conflict: A Case Study of the Basque Country”, American Economic Review 93(1), pp. 113–132. Aichele, R. and G. Felbermayr (2015), Kosten und Nutzen eines Austritts des Vereinigten Königreichs aus der Europäischen Union, April, Munich. Badinger, H. (2005), “Growth Effects of Economic Integration: Evidence from the EU Member States”, Review of World Economics 141, pp. 50–78. Baier, S. L. and J. H. Bergstrand (2007), “Do free trade agreements actually increase members’ international trade?”, Journal of International Economics 71(1), pp. 72–95. Confederation of British Industries (CBI) (2013) Our Global Future, The Business Vision for a Reformed EU. Crafts, N. (2015), “West European Economic Integration since 1950: Implications for Trade and Income”, University of Warwick mimeo. Dhingra, S., G. Ottaviano, T. Sampson and J. van Reenen (2016), “ The consequences of Brexit for UK trade and living standards ”, CEP, London. PwC (2016), “ Leaving the EU: Implications for the UK economy ”, 22 March. See e.g. Ottaviano et al. 2014, Booth et al. 2015, Aichele and Felbermayr 2015, Dhingra et al. 2016 for CGE trade models; and Pain and Young 2004, PwC 2016, Oxford Economics 2016 for general CGE macroeconomic models.